Contain Those Crawlers poster . This poster explains the harmful effects of earthworms on hardwood forests. What’s the big deal about earthworms in Minnesota? All of the terrestrial earthworms in Minnesota are non-native, invasive species from Europe and Asia (There is a native aquatic species that woodcock eat). At least fifteen non-native terrestrial species have been introduced so far. Studies conducted by the University of Minnesota and forest managers show that at least seven species are invading our hardwood forests and causing the loss of tree seedlings, wildflowers, and ferns. See “What are the harmful effects of non-native earthworms” below for more information. Why aren’t there native earthworms in Minnesota? We have no evidence that earthworms ever inhabited Minnesota before European settlement. Even if they did, the glaciers killed any native North American earthworms in our region. For the last 11,000 years since the glaciers receded, Minnesota ecosystems developed without earthworms. There are over 100 species of native North American earthworms in unglaciated areas such as the southeastern U.S. and the Pacific Northwest. However, native species have either been too slow to move northwards on their own or they are not able to survive Minnesota’s harsh climate. How did the 15 earthworm species get here? What are the harmful effects of non-native earthworms? Minnesota’s hardwood forests developed in the absence of earthworms. Without worms, fallen leaves decompose slowly, creating a spongy layer of organic “duff.” This duff layer is the natural growing environment for native woodland wildflowers. It also provides habitat for ground-dwelling animals and helps prevent soil erosion. Invading earthworms eat the leaves that create the duff layer and are capable of eliminating it completely. Big trees survive, but many young seedlings perish, along with many ferns and wildflowers. Some species return after the initial invasion, but others disappear. In areas heavily infested by earthworms, soil erosion and leaching of nutrients may reduce the productivity of forests and ultimately degrade fish habitat. Without earthworms a lush forest floor. After earthworms invade, much of the beauty is gone. Aren’t earthworms good for soil and gardens? It depends. Earthworms create a soil of a certain consistency. For soils that are compacted due to heavy use by agriculture and urbanization, for example, earthworm tunnels can create “macro-pores” to aid the movement of water through the soil. They also help incorporate organic matter into the mineral soil to make more nutrients available to plants. However, in agricultural settings earthworms can also have harmful effects. For instance, their castings (worm excrement) can increase erosion along irrigation ditches. In the urban setting, earthworm burrows can cause lumpy lawns. Relative to simplified ecosystems such as agricultural and urban/suburban soils, earthworm-free hardwood forests in Minnesota have a naturally loose soil with a thick duff layer. Most of our native hardwood forest tree seedlings, wildflowers, and ferns grow best in these conditions. However, when earthworms invade they actually increase the compaction of hardwood forest soils. Compaction decreases water infiltration. Less infiltration combined with the removal of the duff and fallen tree leaves results in increased surface runoff and erosion. If non-native earthworms are already here, isn’t it already too late? No. Without humans moving them around, earthworms move slowly, less than a half mile over 100 years. If we stop introducing them we can retain earthworm free areas for a long time. Also, there are many other non-native earthworms available for sale that could have even more harmful effects. Even in areas with earthworms already present, we don’t want to risk introducing any of these other species. What about worms in compost piles? Non-native “red wiggler” earthworms are sold and shipped all over the country for home compost piles and vermicomposting (worm composting) operations. Thus far, they are not known to survive Minnesota winters. However, if they or other species are able to survive winter and escape from compost piles they could further harm native forests. If you have a compost pile in a forested area, do not introduce additional non-native earthworms. If you are concerned about spreading non-native worms with your compost, you can kill worms and their eggs by freezing the compost for at least 1 week. See the brochure “Composting with earthworms… the right way” by Great Lakes Worm Watch for more info. Can earthworms be eliminated from forests? Currently there are no economically feasible methods. Preventing earthworm introductions is the best protection. Don’t dump your worms in the woods. It’s illegal to release most exotic species into the wild (Minnesota Statutes 84D.06). 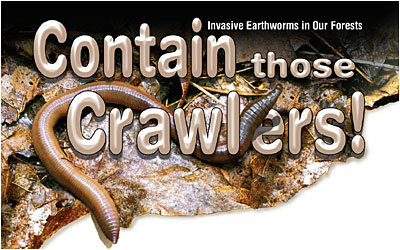 Tell others “the dirt” on invasive earthworms in Minnesota.